Obstructive Sleep Apnoea (OSA) and Central Sleep Apnoea (CSA) go hand in hand with health conditions that affect the respiratory, nervous, cardiovascular and endocrine system. 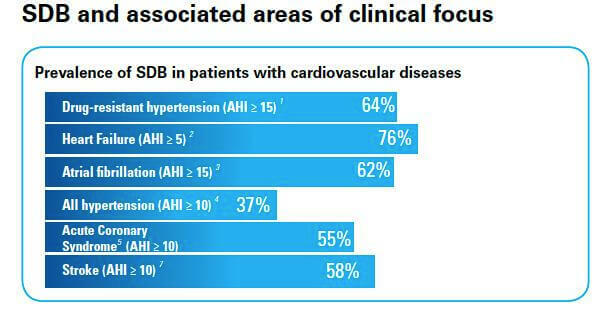 Consult the graph below for more details on associated chronic diseases. Although scientists continue to research the risks created by, and associated with, sleep apnoea, patients’ sleep-disordered breathing often goes untreated. Learn how to treat a patient’s sleep apnoea to diminish the risk of other chronic diseases. ResMed explains the various cardiovascular diseases (CVD) associated with sleep apnea: hyptension, coronary artery disease, cardiac rhythm disorders, heart failure, stroke. Sleep apnoea and Chronic obstructive pulmonary disease (COPD) often coexist in sleep-disordered breathing (SDB) patients. Learn more about the relationship linking COPD to sleep apnoea. The association between type 2 diabetes and sleep apnoea has been widely documented in research. Find out why the International Diabetes Foundation recommends routine two-way screening in sleep disordered breathing (SDB) and type 2 diabetes patients. Pedrosa, R.P., et al., Obstructive sleep apnea: the most common secondary cause of hypertension associated with resistant hypertension. Hypertension, 2011. 58(5): p. 811-7. Oldenburg, O., et al., Sleep-disordered breathing in patients with symptomatic heart failure: a contemporary study of prevalence in and characteristics of 700 patients. Eur J Heart Fail, 2007. 9(3): p. 251-7. 3: Stevenson, I.H., et al., Prevalence of sleep disordered breathing in paroxysmal and persistent atrial fibrillation patients with normal left ventricular function. Eur Heart J, 2008. 29(13): p. 1662-9. 4: Sjostrom, C., et al., Prevalence of sleep apnoea and snoring in hypertensive men: a population based study. Thorax, 2002. 57(7): p. 602-7. 6: Bassetti, C.L., M. Milanova, and M. Gugger, Sleep-disordered breathing and acute ischemic stroke: diagnosis, risk factors, treatment, evolution, and long-term clinical outcome. Stroke, 2006. 37(4): p. 967-72.